One of this week's writing prompts for the Writer's Workshop is: Open your picture folders, close your eyes and pick a random photo to share and write about. 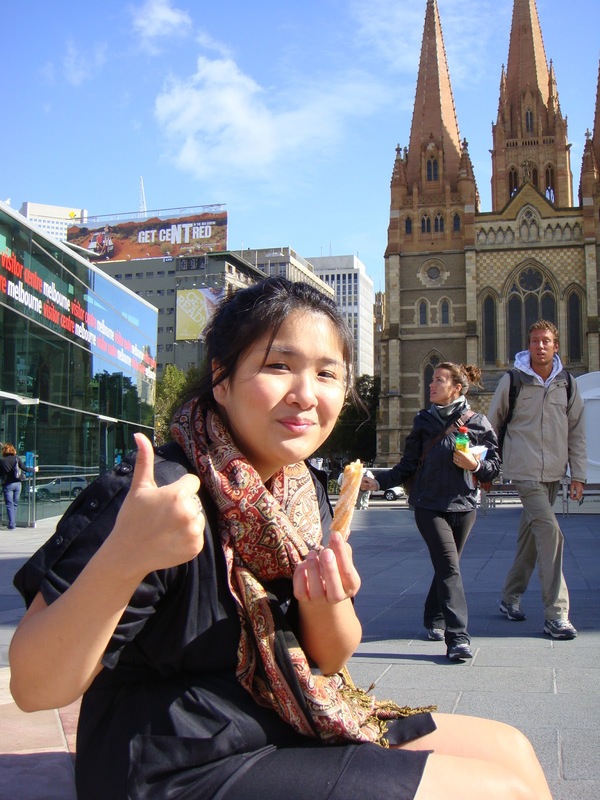 The photo that my finger landed on was one taken by my best friend back in 2009, while we were on holiday in Melbourne. For whatever inane reason that was floating around in my head at the time, I'd stupidly decided to make a thumbs up sign every time she took a photo of me eating. So, that meant I had a thumb up in about half of my holiday photos from this trip. However, the churros in Melbourne definitely deserve a thumbs up. Especially the ones from Chocolateria San Churro. Muy bueno! Same goes for their coffee. In all seriousness, I would love to move to Melbourne. It's such a vibrant city, so diverse in style. You could turn into one alleyway filled with high fashion designer boutiques, and turn into the next one that has hipster hangouts and shops filled with kitsch knickknacks. It's one of, if not the most, charming cities I've ever seen in the world. That looks like a beautiful place to visit... or live! Dropping by from Mama Kat's! Your blog looks beautiful Toni! Melbourne is an amazing city, I love it too. And the churros are just starting to be popular here in Adelaide... all those little taperia places are opening up everywhere! Hi, my kids pucker their lips when I try to take their pictures. I have to fuss to get them to smile normal. I would love to visit Melbourne. I have never been out of the states. Thanks for the virtual trip. PS, I am now following you on Facebook and a Google Connect Friend. Look forward to reading more of your blog. Ah! Melbourne is on my list of places (that is ever growing) to visit some day! I love funky cities, big and small, so it sounds like Melbourne would be right up my alley.